At the Headache Clinic, affiliated physicians provide comprehensive care to patients suffering from all types of chronic headaches and migraines. The clinic makes high-quality care convenient for patients in the greater Sugar Land and southwest Houston communities. Chronic headaches and migraines are among the most common ailments treated by physicians, affecting patients of all ages and leading to disabling bouts of pain and discomfort that can impact quality of life. The causes and symptoms of headaches can vary dramatically between patients. The goal for physicians affiliated with the Headache Clinic is to determine the underlying causes of a patient’s headaches and tailor treatments to each patient’s unique symptoms to minimize disability and improve quality of life. To schedule an appointment at the Headache Clinic, please call (281) 238-3737. These severe headaches are often accompanied by other symptoms, such as nausea, sensitivity to light and dizziness. The causes of migraines vary, but they are frequently triggered by dietary or lifestyle choices. For example, certain types of food, dehydration, lack of sleep, or stress may trigger the onset of a migraine. These common headaches are often the result of increased stress, lack of sleep, or dietary decisions. Tension headaches usually do not prohibit patients from completing their daily activities, although the headaches may still have a serious impact on quality of life. This extremely painful condition is caused by damage or irritation to facial nerve endings. The pain may be triggered by a variety of activities, including eating, brushing the teeth or touching the face. Typically short in duration, cluster headaches can be very painful. They usually occur with some regularity – for example, patients may experience headaches during roughly the same months each year. They usually affect one side of the head and are centered around the eye. The specific causes of cluster headaches are not well understood; research aimed at developing a greater understanding is under way at the Mischer Neuroscience Institute at Memorial Hermann-Texas Medical Center and McGovern Medical School at UTHealth. This type of headache is caused by other, often severe neurological disorders such as aneurysms, brain tumors or meningitis. Depending on the underlying cause, secondary headaches may require immediate care to resolve. The underlying causes, symptoms and effectiveness of different therapies for chronic headaches can vary significantly between patients, increasing the difficulty of diagnosis and treatment. Physicians at the Headache Clinic use the most advanced diagnostic techniques, beginning with a complete evaluation by the physician team. Treatment involves a comprehensive approach for the best possible outcomes. Physicians affiliated with the Headache Clinic may prescribe a variety of treatments, including Botox® injections, physical therapy, psychological support, lifestyle counseling or infusion therapies. In certain cases, surgical interventions may be required to address the underlying cause of the headaches. Physicians affiliated with the Headache Clinic limit the use of habit-forming medications that lessen the symptoms without resolving the underlying cause of chronic headaches and that can lead to dependence, depression and disability. To schedule an appointment at the Headache Clinic, call (281) 238-3737. Dr. Hamid Hamdi is board certified in neurology and fellowship trained in neurorehabilitation. Dr. Hamdi earned his medical degree at Dow Medical College in Karachi, Pakistan. He completed his neurology residency at Nassau County Medical Center, the clinical campus for the State University of New York at Stony Brook, where he was chief resident. He subsequently completed a fellowship in neurorehabilitation at the Hospital for Joint Diseases at New York University School of Medicine in New York City. He joins Mischer Neuroscience Associates from New York University, where he held a faculty appointment as clinical assistant professor. Dr. Hamdi has years of experience treating patients that suffer from a wide variety of chronic headaches and migraines. As part of the Memorial Hermann Sugar Land Headache Clinic, Dr. Hamdi follows a multidisciplinary and customized approach to diagnosis and treatment, working with other clinical practitioners as needed to provide comprehensive care for his patients and relief from their headaches. Dr. Hamdi’s practice is located on the Memorial Hermann Sugar Land campus in Medical Plaza 2, near the intersection of Highway 99 and Highway 59. 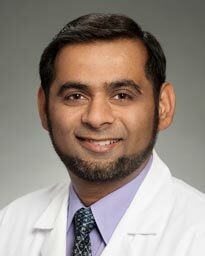 Dr. Muhammad Faisal Khan is a board-certified neurologist working at Memorial Hermann Sugar Land Hospital. Dr. Khan attended the prestigious King Edward Medical University in Pakistan. His residency training was at the University of Nebraska, where he was an associate chief resident. He furthered his education by doing a fellowship at Duke University in neurophysiology/sleep. Dr. Khan has vast experience in treating patients who present either with first episodes of severe headache or with chronic and debilitating headaches. He always maintains an empathetic attitude. Dr. Khan carefully delineates treatment outlines based on individual`s symptomatology and delivers an effective management plan which includes therapeutic as well as preventive measures. His patient population includes people of all ages and genders with diverse geographical and professional backgrounds. He is well aware of newer advancements in the realm of headache medicine and is eager to help the community where he practices. 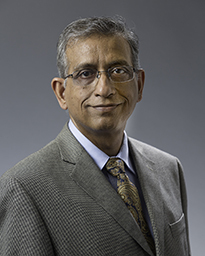 Currently, Dr. Khan is the director of the neuroscience program at Memorial Hermann Sugar Land, and is actively and passionately engaged in delivering quality patient care. He manages patients presenting with disorders of the brain, spine, nerves and muscles. New patients are scheduled at his practice, Sugar Land Neurology and Sleep, which is located near the intersection of Highway 59 and Highway 6.